A seventh-year linebacker who has totaled 339 tackles (267 solo), 73.5 sacks (461 yds. ), one interception, 13 passes defensed, 19 forced fumbles and five fumble recoveries in his first six seasons with Denver. 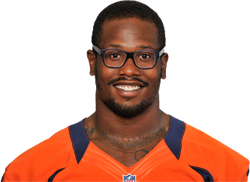 Named AFC Defensive Player of the Month for October 2014 after leading all NFL players in sacks (7) and tackles for a loss (10).